More than a century ago, philanthropist Christopher Lyman Magee donated $125,000 for the construction of a zoological garden in Pittsburgh’s Highland Park neighborhood. Today, the zoo, which sits on 77 acres of parkland, is one of the top six major attractions of its kind in the country. With more than 4,000 animals on display, the zoo is getting ready for warmer weather, and with that, welcoming plenty of new tourists. Employees working with plants at the Pittsburgh Zoo and PPG Aquarium in Pennsylvania. Spring preparations include many horticultural activities, according to the curator of Horticulture. Photo by Paul A. Selvaggio. Pizzi said that once danger of frost is no longer a risk the prep team targets hundreds of tender tropical plants that need to be installed in various areas of the zoo, as well as annual plants in containers. “Many areas are deep cleaned, painted and generally spruced up,” said Pizzi, including the carousel and other amusement areas. Many of the animal exhibits also receive a general cleanup. Sod is laid, grass is seeded and fences are checked. In addition to focusing attention on the grounds and animal lairs, Pizzi said that all visitor amenities are checked, cleaned and repaired as needed – this includes scooter rentals, wagons, trams and any other feature at the zoo that is accessed by guests. “Any area that was closed for the winter is reopened and prepared for visitors,” he explained. Elaine Gruin, curator of Education for ZooAmerica North American Wildlife Park in Hershey, Pa., has been busy freshening up exhibits with new mulch and bedding this season. She said that as the staff gets ready to welcome tourists for spring and summer, parts of the zoo also get painted or pressure-washed wherever necessary. This spring, the zoo will be featuring a new exhibit related to the great horned owl in its own Great Southwest building. “The desert garden has also been redesigned and replanted,” said Gruin, who hints that a new resident will be coming to the zoo in the near future. 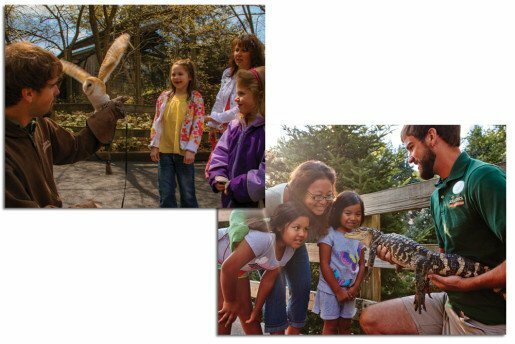 The introduction of a new animal is big news for ZooAmerica with high expectations that it will encourage even more tourist traffic during its busiest season. The zoo has the good luck of being in proximity to other popular attractions, like Hershey Park, Chocolate World and the Tangier Outlet, which all welcome lots of summer visitors. ZooAmerica North American Wildlife Park in Hershey, Pa. This spring, the zoo will be featuring a new exhibit related to the great horned owl. With conservation and education at the heart of the Philadelphia Zoo’s ongoing work, Kristen Waldron, director of Conservation Education and Integration, has been getting ready for new exhibits and entertaining ways to share important messages about animals. The efforts usually get started in February and continue through March each year, with moments throughout the year dedicated to sprucing up the zoo. Waldron and other staff members recently participated in a zoo-wide clean-up day in which the zoo, which is usually open year-round, was closed for the day so that new mulching could be laid, planting could be done and cleaning could be initiated across the entire campus. “There’s a whole gardening aspect,” said Waldron. “We get the beautiful gardens ready for the season and we work on the outdoor animal exhibits.” And while she says that staff does ongoing upkeep throughout the year there is definitely a sense of change in the air at the first sign of spring. New blooms and even new additions to the exhibits can really sharpen the focus on what will ultimately become a very popular season for tourists. “A lot of our sustainability efforts are part of spring readiness,” explained Waldron. There are important messages about recycling shared throughout the space and special receptacles are also cleaned up in anticipation of more visitors. “We operate like a little city,” she said, which makes sense considering the zoo, the oldest in the country, is spread out over 42 acres. In addition to being a popular tourist attraction, the aquarium is a leading facility for animal conservation and research. It takes 10 million gallons of marine and salt water to keep the Georgia Aquarium up and running in Atlanta. In addition to being a popular tourist attraction, the aquarium functions as a leading facility for aquatic animal conservation and research. It leads research on important environment issues that have a far-reaching impact globally. Roger Montiel, manager of guest programs at the aquarium, explained, “We not only care about our animals, we care about our guests, too.” He said the staff tries to plan ahead for each season, thinking of different ways to ready for extended operating hours and larger guest counts. To keep up with the demand, Montiel spends a lot of time in meetings as extensive planning goes into creating well-rounded experiences each year. He works closely with guest-facing and behind-the-scenes teams to ensure they are delivering the best possible experience for each visitor – ones who may be new or returning. 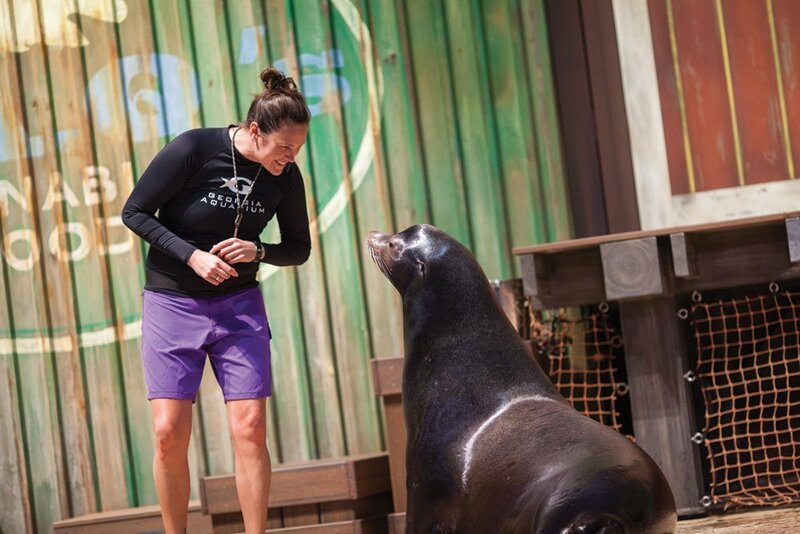 “At the end of the day, our goal is to create the best experience possible for our guests, showcasing our living collection, the care provided to our animals, and passion of our team, ultimately creating awareness to help preserve our oceans for future generations,” he said. Department managers also meet each morning to discuss the day’s operations, guest flow, special events and to share challenges and successes from the previous day. This is the team’s opportunity to communicate and make sure everyone is equipped with necessary information to make each new day a success. 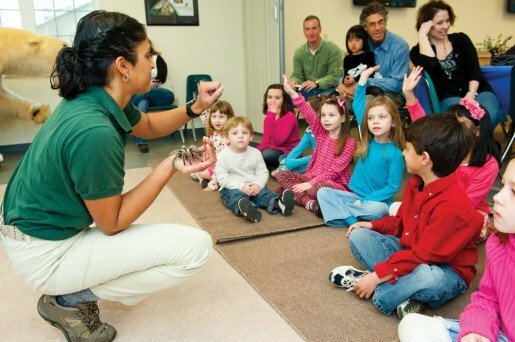 Education Specialist Theresa Wilson of ZooAmerica North American Wildlife Park works with guests. A new resident will be coming to the zoo in the near future. Located halfway between New York City and Philadelphia, Jenkinson’s Boardwalk is in the heart of the famed Jersey Shore in Point Pleasant. The privately owned and managed destination not only features a popular coastal retreat, but also a boardwalk and aquarium. Since it opened in 1991, the facility has been focused on showcasing marine life and aquatic habitats for the sake of education and conservation. With a new exhibit about seals opening this spring, the team has been very busy getting ready for the high season. Claus says the planning gets started several months in advance of the spring and summer season to make sure the animals are available and can go through a lengthy quarantine process before they are introduced to the resident animals. She also begins hiring staff to help with the increase in school and summer camps that visit. How do you start preparing for your busiest time of year? To prepare for the summer tourism season we hire extra staff, part-time ticketing and front-end staff, and occasionally a temporary educator position to help with summer camps. You’re open year-round – so does that mean that there’s an annual plan in place to keep up with demands? Because we are a year-round operation we don’t take any additional steps to make the destination ready for visitors. It is always ready. We are always working on exhibits to keep them clean, fresh and in proper working order. We do boost our marketing budget to focus on the summer season when Duluth sees tens of thousands of tourists. What can we expect this new season? In the summer of 2016 we will be unveiling a new exhibit called “Unsalted Seas.” The exhibit tells the story of the large lakes of the world. The 3,500-square-foot gallery hall currently under construction will, for the first time in Great Lakes Aquarium history, increase the exhibit space and create a bigger, more dynamic facility. “Unsalted Seas” will feature an 8,000-gallon sturgeon touch pool, a giant cichlid tank and an interactive reproduction of the Blue Heron, a University of Minnesota-Duluth research vessel. The exhibit space will overlook the working Twin Ports harbor and gateway to Lake Superior. What about seating? How do you accommodate guests? Currently, we have wooden benches throughout our facility, but we are replacing them this spring with Loll benches made in Duluth, Minn., from recycled high-density polyethylene. We are excited about the change, which we believe will refresh and modernize our space. Our lobby features wooden tables and chairs. A Question of Seating: What Material Works Best? Kristen Waldron of the Philadelphia Zoo: “We have varied seating throughout the zoo that’s part of our history. When we unveil new seating we look at sustainability, particularly recycled plastic.” The zoo actually has its own committee focused on sustainability issues that plays a huge role in what the zoo purchases. What preparations do you take to get the destination ready for the spring and summer seasons? Adventure Aquarium consistently focuses on guest satisfaction, regardless of the time of year. To prepare for the spring and summer seasons, we increase our programming in order to accommodate more guests throughout the day. There’s our “Meet the Divers” and “Who Wants to be a Fishonaire?” shows, as well as Ocean Realm, Hippo and Penguin feeds, and other programming, such as Gill’s Dance Party and Ice Age: No Time for Nuts 4D Shows, which are offered at various times each day to ensure guests will have numerous enjoyable opportunities during their visit. In addition, we increase the size of our staff for the spring and summer seasons in order to service our guests in the best way possible. Do you plan to unveil any new exhibits or additions to the aquarium this season? With a grand opening of Friday, April 8, we’ll invite guests to the Dare to Cross Shark Bridge, the longest V-shaped rope suspension bridge in the world at 81-feet, which will bring guests just inches above nearly 30 sharks.